Socialist France once again outdoes the us' "free market" with unlimited wireless for 5x less the price. Remember when AT&T tried to buy T-Mobile last year for $39 billion, and how it kept insisting that reducing the number of national wireless carriers from 4 to 3 wasn't a problem because the market was just so competitive? 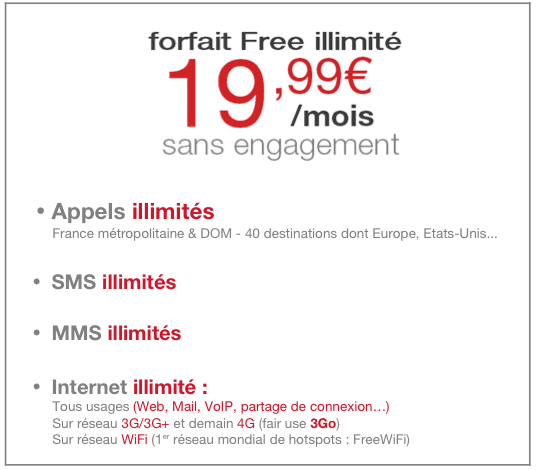 If you want to see what real competition looks like, turn to (gasp) France, where the hugely popular Free.fr broadband provider just blew the doors off the mobile marketplace with its €20month unlimited use plan. This was a story too important to bury beneath the deluge of gadget news pouring forth from CES. Free has long been one of France's most popular Internet providers. When we profiled them back in 2009, the company was offering 20-30Mbps Internet, free landline phone call to 100 nations, and TV service along with an HD DVR for €30 (US$45) a month.